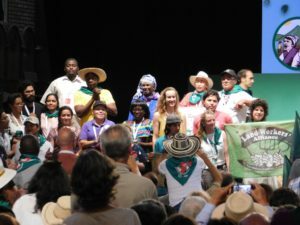 (Harare, October 3, 2017) During the VIIth International Conference of La Via Campesina, held in in Derio, from the 19th to the 24th July in the Basque country, 29 new member organisations were presented and accepted in the world largest international peasant movement. The new members were presented by their respective regions, of which South America and Central America had the most new organisations- a total of 17. La Via Campesina now has about 182 member organisations in over 81 countries around the world. This growth adds to and enriches the diversity and unity in the struggles, an important aspect to achieve a world based on food sovereignty, social justice and dignity. 1.Bangladesh Agriculture Farm Labourers Federation (BAFLF), Bangladesh. 2.Pakistan Kissan Rabta Committe (PKRC), Pakistan. No hay miembros nuevos. / There is no new member / Il n’y a pas de nouveau membre.